Like you, I am fascinated in what Johnny Manziel can do in the AAF. Maybe that is a success for the start-up league, in and of itself. Interest, along with money, is what's going to keep this thing alive for as long as possible. So when news came down over the weekend that the Alliance had signed a player agreement with Johnny Manziel, it piqued whatever interest had been waning over the past few weeks. The moment Manziel was released from the Montreal Alouettes and barred from the Canadian Football League, the AAF seemed like a possibility. Where he'd end up, though, depended on a number of factors. Upon clearing the league's background check, Manziel's rights were released by their holder, the San Antonio Commanders. Manziel was instantly picked up by the Memphis Express, where he'll finish out the 2019 regular season. Barring a miraculous -- meaning, in all likelihood, undefeated -- run in the final four weeks, the Express will not make the playoffs. That could be an incentive for the Express to play Manziel right away. Create some buzz, see what he can do without grave consequences and look ahead to 2020. But there's more to this project than that. Manziel has a history, one the AAF is trying to re-work. If it's successful, the AAF will be lauded for rehabilitating a troubled player, maybe even getting him back to the NFL. And if it doesn't, oh well. The stakes for signing Manziel aren't particularly high, but that doesn't make his entry into the AAF any less interesting. It's low-risk and high-reward, but the reward is probably a long shot. In speaking with people around the league, here's what I've learned. To the dismay of some, the Commanders immediately released Manziel's college allocation rights. Moving on from the polarizing quarterback drew some criticism for general manager Moose Johnston. In a setup in which teams take on as much notable regionalized talent as possible, Manziel, a former Heisman winner at Texas A&M, certainly made a lot of sense in San Antonio. And in a league that could use more recognizable names at quarterback, he provides an instant boost in that category. Johnston countered with a statement full of buzzwords about culture and getting better. "When I took this job as general manager of the Commanders there were foundational experiences from my career as a player and as a broadcaster that I would not deviate from. There were also things that I would have to learn from my experience on the job. One of the most important things I have already learned is when there is an opportunity to get better … you get better," he said. "The challenge is finding the balance in what I know and what I have learned and finding the best solution to get better as a team. I truly believe that the moves necessary to add Johnny to our roster do not make us better at this time." Johnston went on to wish Manziel the best and said that he looks forward to competing against him in the future. It was a polite way to say he didn't think Manziel was worth the trouble. Yes, Manziel to the Commanders made surface-level sense, but make no mistake: Johnston is justified to feel the way he does. Manziel was not a savior for the Cleveland Browns. He played in 15 games in two seasons, starting eight, threw as many interceptions as he did touchdowns (seven), and while he had his moments, wasn't close to a game-changer as a first-round pick. His CFL years weren't much better. In eight game appearances with the Alouettes, he threw five touchdowns to seven picks. Chalk some struggles up to rule changes for the CFL, but it hardly changes the overall impression of him as a pro quarterback. Normally, all of that wouldn't be a huge deal, as many of the AAF's players are here to begin with because they weren't exactly Sunday stars. It was the baggage that hurt Manziel's chances with the Commanders. Not all baggage is the same -- for example, entering a treatment program in 2015 was a personal issue. But, from domestic violence claims to suspensions and being fired by agent Drew Rosenhaus, there's been a lot to unpack. And, now, he was not only released by the Alouettes, but effectively barred from the entire CFL. I've asked multiple people about what happened and either they didn't know or wouldn't say on the record. One report from Benjamin Allbright says Manziel didn't report to mandatory counseling. "We did a great deal of due diligence on Johnny coming out of the CFL," AAF CEO Charlie Ebersol said. "We felt very comfortable that it was a decision that would be in the best interest of both him and our league." So, no, Johnston didn't feel like he needed that on his team. To wit, the Commanders are 4-2 with a top-three offense and are in the driver's seat in the West division playoff race. Even if they signed Manziel, quarterback Logan Woodside has overcome a slow start and developed into one of the top three passers. In his last three games, Woodside has 560 yards passing, four touchdowns and one pick -- all on the road. All wins. Even if the Commanders took Manziel, how could they possibly inject him into the offense now? And if they did, what would that say to the rest of the team? Remember: this is Johnston's first year as a GM, too. And while Manziel may have been good for attracting more eyeballs right away, there are few guarantees for how long they'd stay fixated. The Commanders far and away led the AAF in attendance with more than 28,500 people in the first two weeks. Whether they'll repeat those numbers after a month away from home remains to be seen. Sure, more butts in the seats is always a good thing. The Alamodome can hold more than 60,000 fans, easily doubling what the Commanders have drawn so far. Still, the fact remains they were doing fine without him. This is all within the lens of 2019, of course. In seeing the forest for the trees, would it have been wise for the Commanders to sign Manziel, sit him, develop him, work with him and then try again in 2020? Maybe. There's such minimal risk in keeping him because of the way contracts are structured, but bear in mind Manziel has been fired or traded three times in the past three years. San Antonio played the numbers. I've been incredulous from the start that any team truly needed Manziel. However, Memphis is about as close as it gets. 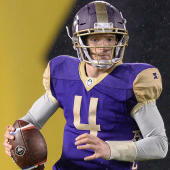 The Express are the worst team in the AAF with the second-worst offense and a porous offensive line, and they lost quarterback Zach Mettenberger to a leg injury against the Salt Lake Stallions in Week 6. At the time of his injury, Mett was actually the second-most efficient signal-caller in the Alliance. If any team needs some juice right now, it's the Express. Maybe Manziel provides some, but more on that later. The subject of immediate importance is getting him in line. That's where coach Mike Singletary comes in. A statement from the league's front office over the weekend concluded with a short but telling sentence: "we all believe he'll benefit from the coaching and mentorship of Mike Singletary." Forget the win-loss percentage, which is technically why Memphis landed Manziel when San Antonio released his rights. The AAF, as a single entity, is supportive of how this all worked out. If Manziel had signed with San Antonio, that mentorship would come from Mike Riley. I'm not here to tell you Riley can't discipline players or mentor them. He's an incredibly smart football coach who also happens to be one of the nicest, most genuine people with whom you'll ever speak. He makes players better all the time. But this project wasn't for him. Singletary is an old-school coach who is well-liked within the AAF. It's tough to be a disciplinarian in pro football, but he's the kind of mentor who can get Manziel going in the right direction. Success or failure many times is situational. That's not to imply Manziel isn't responsible for his own mistakes. He most certainly is. But there reportedly wasn't much accountability at A&amp;M when Manziel was there. To go from that to the NFL, where an organization will only babysit you for so long (if at all), is a stark transition. We think of pro football players as men -- and they are -- but most are still in their 20s. Part of the development process in the AAF is mental as much as physical or football-related. Know this: Manziel, who, at 26, has already experienced a lot in the past five to six years, is not the only major project in the AAF. There are others, they just haven't received this level of attention. The AAF is a stop-gap between college and the NFL. It's a pro league, but not one in which you'll be left behind with the same level of frequency. The right coach and the right situation may finally be what Manziel needs to turn it all around. Otherwise, short of the XFL's return in 2020, he's running out of options. Will Manziel make an impact right away? It's understandable that someone would take yet another chance on Manziel. Whether he'll be an impact player right away -- or in 2019 at all -- is another story. He arrived in Memphis on Sunday and began working out with the team on Monday. He'll have just a few practices to get ready for the Express' Sunday night home game against the Birmingham Iron. He may not start. He may not even play. While Memphis is probably not playoff-bound, rushing Manziel on to the field for the sake of playing him isn't all that smart, either. In fact, the idea that Manziel is already the best quarterback in the AAF without having taken a single snap is foolhardy. Frankly, it's also disrespectful to guys like Garrett Gilbert and John Wolford. Both of them have worked hard, shown improvement, have complete command of their teams and could easily end up on an NFL roster again sooner than Manziel. No one knows what Manziel is going to be yet. He is talented and exciting to watch. He's a playmaker, no doubt about it. But don't forget that it took a good four to six weeks for most of the AAF's teams to build rapport on offense. Even still, the chemistry is not 100 percent there. There are still dropped passes and miscommunications. Still, these players were in training camp together and have worked closely for the better part of four months now. Manziel won't walk in to practice and have an immediate connection. Earning respect is important for Manziel, too. Players in the AAF know this is likely their last chance to have a career playing football. They work hard and stay out of trouble. If they don't, they're waived easily. Manziel has to subscribe to that lifestyle. He might be able to make highlight-worthy plays on the weekend, but what he does during the week matters just as much. The AAF doesn't take itself too seriously. It doesn't compare itself to the NFL. It's not trying to be something it's not. But the process by which it fields eight football teams is serious business. If Manziel is going to make it as a pro beyond having a couple of great games, he needs to start taking it seriously, too.